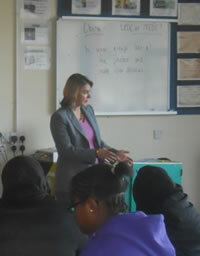 The initiative aims to give pupils a better idea of the range of opportunities available to them in the world of work. Speaking at the first event, Justine said,“Often pupils only know about the sort of work that their immediate family or friends do. This initiative aims to bring people and businesses in to talk to them, to tell them about their job, what they do, how they got there and what skills, qualifications or experience they need to do it. I also want to get people to tell their stories – to show that many of us start off by doing one job and end up doing something completely different. I hope that this will give them information and ideas, as well as encouragement, to start thinking about the range of careers there are out there”. Justine was joined at the first event by Steve Cabrera, a management consultant who also works alongside children, charities and community groups on health and fitness programmes, Laura Kuenssberg, Business Editor at ITN News (pictured left) and Giuseppe Minetti, who is a personal trainer and owns the Token Yard Gym in Putney. 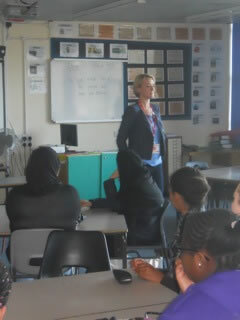 The speakers talked to groups of Year 10 pupils who were then able to ask questions.